It seems that an increasingly large number of people are arriving at ze blog after searching about internet and phones here in the Sultanate, so I figured I'd write a little summary of internet connectivity options here to help these searching people as a part of a new series of irregular blog posts I intend to write: The MM guide to Oman. 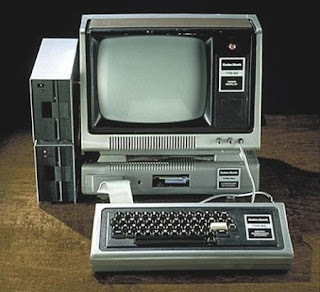 Essentially, in Oman, there are 2 methods for internet connectivity: ADSL or Wireless. By wireless, I mean either 3G (or 4G!) or WiMax. In terms of vendors, there are two major ones to consider, plus a few smaller MVNO's (I'll get to them in a moment): For ADSL, your only option is Omantel, for Wimax, it's Nawras. Some brief history here, Omantel is the government-owned incumbent tel-co and Nawras started up here back in 2005 and is the main competition to Omantel (the share-holder listing makes for interesting reading; the local Omani partners include Ministry of Defence Pension Fund, Royal Office Pension Fund, Diwan of Royal Court Pension Fund, Internal Security Service Pension Fund and Sultan’s Special Force Pension Fund). So - Omantel, over years of government funded works have got copper and fibre lines all over the place, whereas Nawras do not. Both Omantel and Nawras have their own dedicated fibre back-bones to the outside world - but because of the immense cost it would be for Nawras to install their own phone lines to peoples houses, they have opted for wireless technology. Local Loop Unbundling does not exist here in Oman yet - Omantel still own the fibre and copper originally paid for by the State, and so far have resisted requests to share this with the rest of the market to help provide better prices and products to the general consumer. Something to note here is that Haya water (the sewage people) have been laying fibre lines everywhere that they have been installing sewage networks in the capital (Seeb, Maweleh, Azaiba, Ghala, Ghubra, Khuwair, Qurum, Shatti, Wattayah & Wadi Kabir currently, with Ruwi & Hamriyah happening soon) I understand that either Omantel or Nawras will rent these fibre lines from Haya, affording FTTH (Fibre to the Home) across most of the capital..... eventually. Basically, ignore the first two green options, you'd have to be a very light internet user to even consider them. 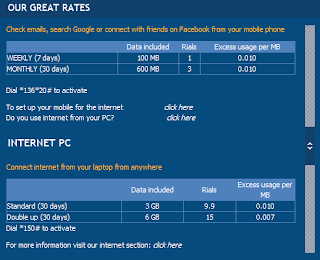 So, to the meat: RO 20 a month gets your a phone line, 2Mb line and unlimited data usage. If you happen to live at The Wave, or Muscat Hills, or another FTTH area (parts of Maweleh) you can get up to 40 Mb line for RO 60 a month (along with a 5Mb upload too). Personally I use the RO 35 plan: 12 Mb, phone line and unlimited data usage - and I've never had one complaint from Omantel about over-usage, despite my occasional efforts to download the entire internet. The single biggest problem with Omantel is the time to install. It's gotten a lot better from when I first moved to Oman in 2007, when it took over 2 months for me to get a phone line installed and ADSL activated for me. These days the time for installation of a phone line and ADSL can vary from as little as a day to as long as a month, depending on your situation. One other point of note is that not all ADSL speeds will necessarily be available to you - it very much depends on where you are. Nawras, being wireless, have leveraged this advantage heavily, and offer same day activation. Theoretically, you sign up in the store, take your modem home and it should work within a few hours. Most of the time this is the case, sometimes there's a little delay but really it's pretty much as advertised. 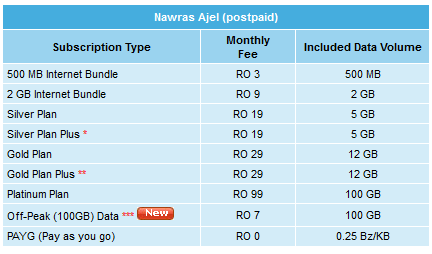 Nawras' pricing is similar to Omantel's in the sense that for RO 24 you get a 5Mb connection with unlimited data usage (versus' Omantels RO 25). I've no experience with Nawras' internet offerings but have heard of peoples connections being throttled for over-usage - but don't let that influence your decision. FRiENDi mobile, Samatel, Renna mobile and Apna Mobile. Apna Mobile is a mobile phone company targeting Indians and pretty much no one else, and as far as I'm aware they do not offer any data plans, just marginally cheaper voice calls to India, and so I wont discuss them any further. 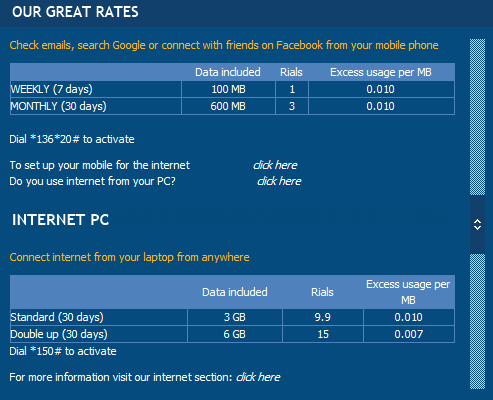 Of note is that they do offer a PC-based internet connection too (Via a GPRS modem requiring a sim card) - but the cost is fairly high when you stack it up against Nawras / Omantel. So for your mobile phone: RO 3 a month for 600MB of data usage with a charge of 10 baiza per MB (that's RO 10 per GB) of overage should you go over 600MB a month. 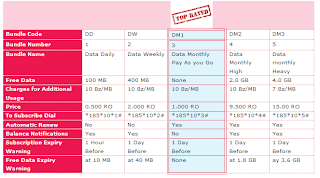 Renna mobile also offer data plans, with plans starting at RO 1 a month (just like FRiENDi), but again their rates are fairly high once you get into heavy usage zones. 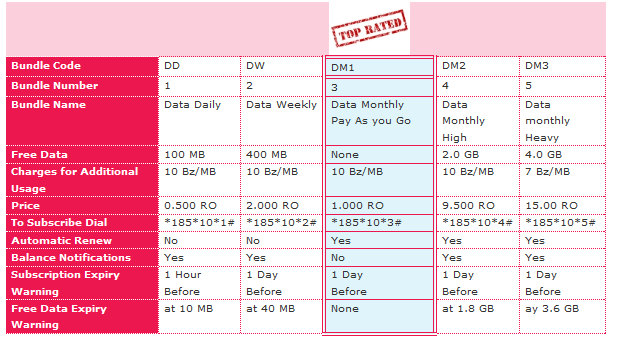 For the RO 9.5 a month, 6.5 RO more than FRiENDi, you get a 2GB data connection - when compared to FRiENDi's 600MB + 1.4GB of usage, the equivalent cost is RO 17 for the same usage (2GB). It really depends on how much you plan to use the internet. Finally, for the MVNO's is Samatel. A bit of an enigma because their website does not actually work right now, and most of their booths (most infamously their airport booth) is usually empty with no staff and thus no way to actually figure out what their products are on offer. I'd advise giving these boys a miss until they sort their stuff out. Omantel has 2 different product lines, just like Nawras, one to reflect it's post paid (contract) plans (known as Mada) and one to reflect it's prepaid plans (known as Hayyak). 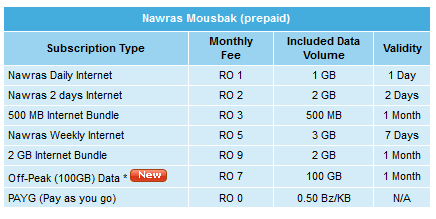 So, just like the MVNO's Omantel has plans that start at RO 1 a day (for 1GB of usage). If you are a heavy user, the 3GB plan is RO 14 a month and the 5GB plan is RO 19 a month - which makes Renna's RO 15 4GB plan fairly attractive to potential customers. 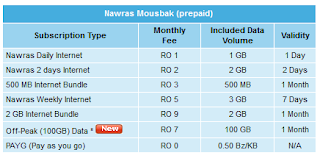 Nawras' prepaid plan's are called Mousbak, and their postpaid plans are called Ajel. As you can see, their offers are very similar to everyone else - it really comes down to knowing how much internet data you plan to use and then choosing accordingly. As for wifi hotspots - there are a few dotted around the capital, Muscat, but don't expect to be able to rely on them - and most are not free. Most of the hotels have "free" wifi hotpots in their bars as an added attraction to get the punters in, so if your in a bind an need to get online for some reason, head to a 5* hotel like the Hyatt or the Radisson and find their bars. Thanks for the post. Finally, someone put the time and effort of bringing all this confusing thing into one picture. A very useful post indeed. Thanks! Omantel has the worst service in the middle east.... all their staff needs to be retrained and also be educated on what customer service really means...on that note i think most if not all retail shops and service companies should be educated on customer service....honestly its a joke! 1 - Does Skype work in Muscat or is it blocked? 2 - Do you know if Betfair.com & similar sites are blocked? Skype officially does not work here, although it does from time to time. I understand that the regulatory authority here are attempting to have this unblocked properly. Betfair.com works here (on Omantel at least). Two months and still waiting for a working Omantel connection in Nizwa. The details beggar belief. Just dreadful "service". With respect, it seems we are living in 1980s while dealing with Omantel and Ooredoo. 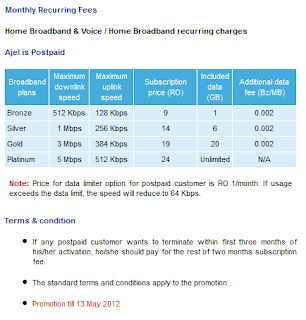 OMG omantel needs 3 months to install a DP in new building even fiber cable is already reached to next building. 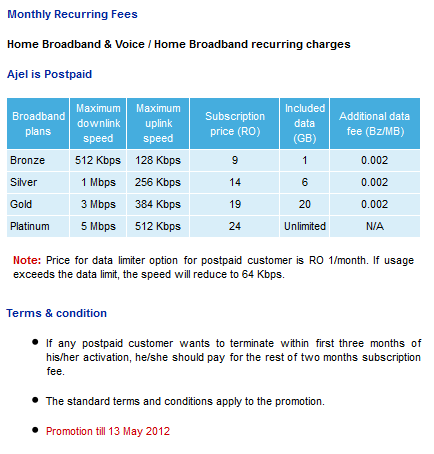 Please do not go for Ooredoo prepaid home broadband. you data limit will be finished as quickly as possible even you have not used much. Their genius technician will tell you they cannot provide you your usage details. Obviously they are bullshitting around. It took you over 2 month's when u first arrived in Oman. It's been 1 year 4 months and 29 days since I applied in 2015, and I haven't yet received it. Every time someone comes down to setup something or the other is broken down. In yhe last year alone I havr visited the Omantel outlet 15 time's. Trust Worthy Investor urgently looking for positive investment opportunities and running business partnerships to invest in i have available required investment capital and looking for any investment opportunities to invest in like a silent partner i need serious business investment opportunities with positive income generating value i am looking more on long term partnership investments which have good profit margin and need additional capital for expansion . I mind i am looking forward to receiving all kind of proposals big and small for i have close to $70,000,000 (Seventy Million United States Dollars ) Ready to invest in businesses which need expansion since am investing like a silent partner .We are not offering any loans we are investing our money in businesses .